Of course this could also be simply used as banner at any time of the year and is something a child could make or be helped to make for a friend as a craft at home or at Sunday School. Basically I wanted something simple & quick to make and for which I would not need to buy extra supplies. 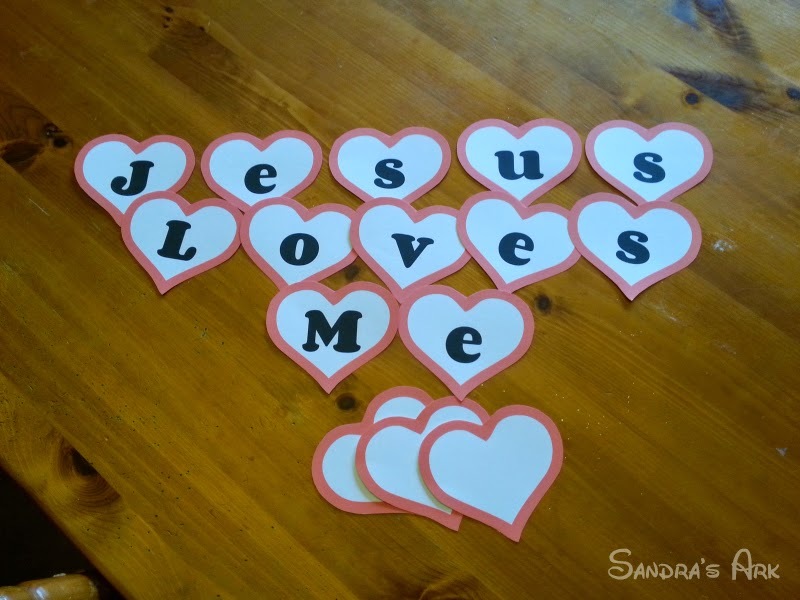 So I came up with this "Jesus Loves Me" banner. I used Ipiccy to make pictures of the hearts with the letters inside them. Some of the letters are repeated in the phrase so I did not have to do every single letter. I left the original blank one in case I decided I would like to use the same heart outline for another project. This depends on how large you actually want your letters to be. Then I used Powerpoint to set out the letters I needed on an A4 sized slide and printed out all the letters involved including 3 blank hearts - never waste space and they can always be used later if not needed now. The cutting out was the most tedious part but I normally do that while I'm watching something on TV so not so bad and of course never waste time. 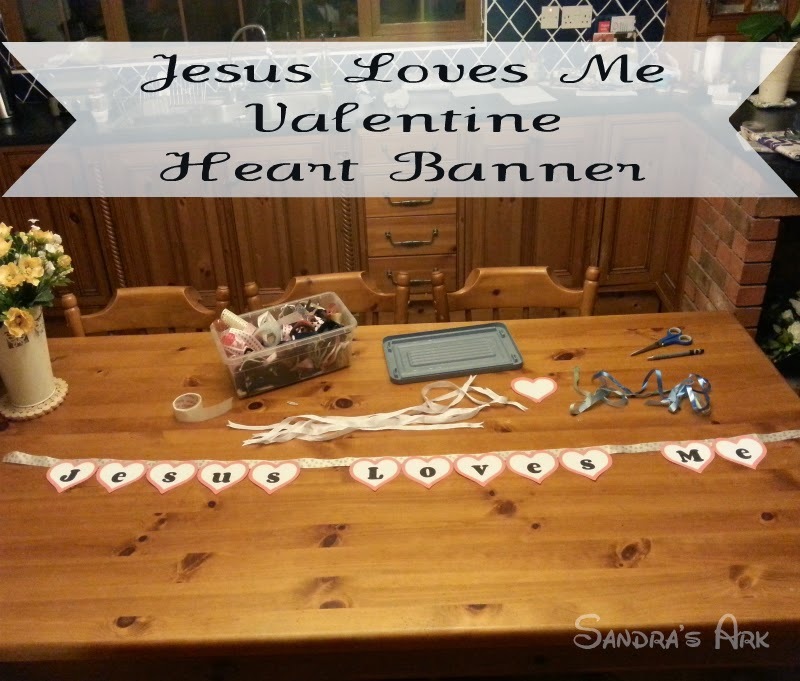 I hunted through all my remnants of ribbon to see if I would have enough pieces to put together to form a long ribbon to which I could attach all the hearts. 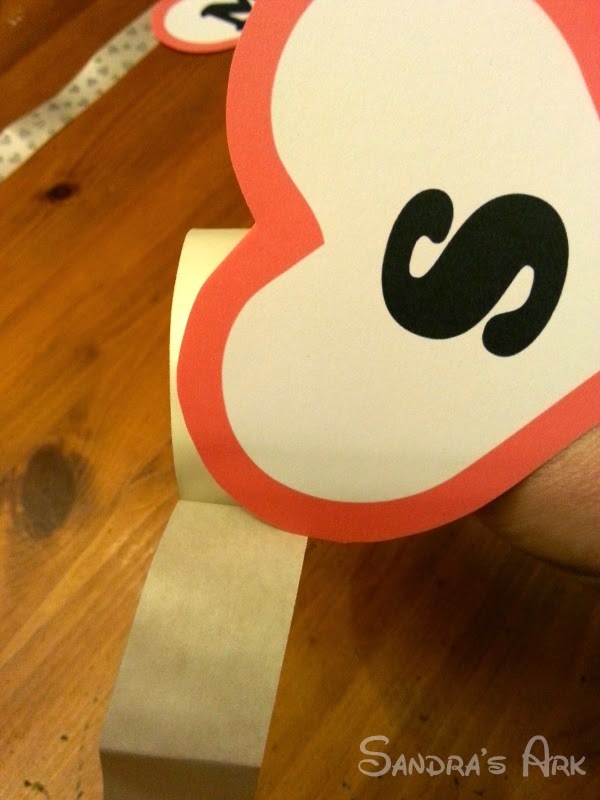 Spacing out the hearts to see how long this ribbon needed to be. Thank goodness I have a long kitchen table. 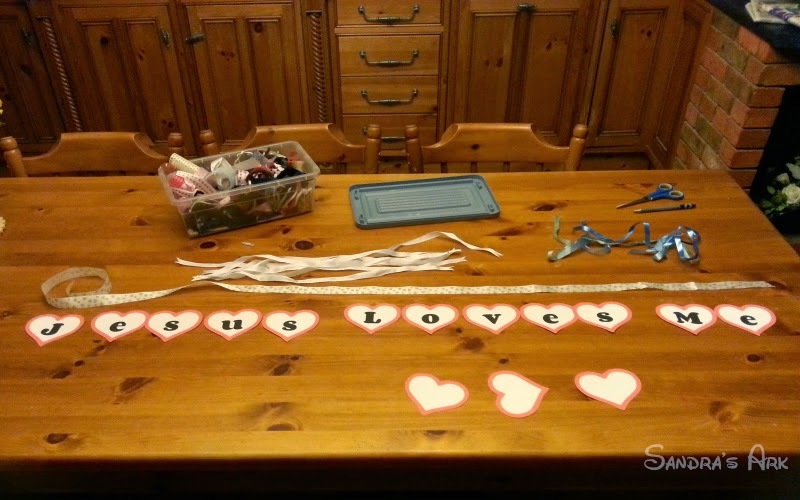 Then I chose the thicker longer ribbon but I could have used the thinner off white ribbon pieces and glued them together behind hearts to make it long enough. So I placed all the letters carefully alongside to get the right spacing before pressing each letter against the glue dots on the roll of dots. Before I pressed them all unto the ribbon. As you can see I used glue dots because they make this type of thing so easy, neater & much quicker than using my glue gun. Don't forget to let me know if you try it out. Using up remant ribbons totally counts as decluttering in my book...and I love the banner. Where did you hang it? Lovely banner! Valentines Day has always been a special day in our home. I love it! What a darling project :). Love this!! Seems like a great craft for my Family Sunday School families. This looks really good. The process seems easy enough. Can try it with my cousins. Thank you!! What a great project. And using up ribbon is definitely decluttering in my book. 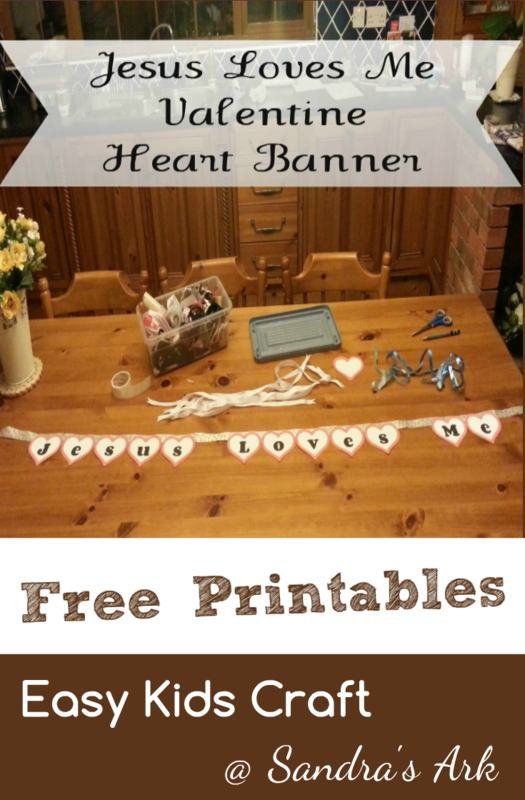 This banner is perfect for decorating a Sunday school room!! I love the design! Thank you for linking up with us for Pinworthy Wednesday! 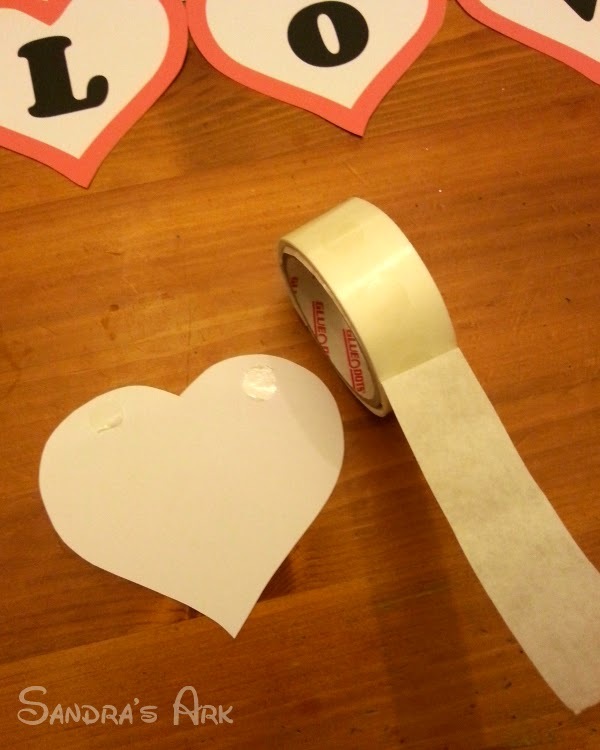 Such a sweet activity - this would be so fun for my girls and I to do together for Valentine's day :) Thanks for sharing! 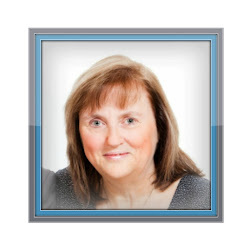 Really glad you stopped by #FridayFrivolity Sandra! So happy to meet you. :) Pinning and tweeting! This is creative and timely. A great idea. Thanks for sharing!